• In the past three meetings between the Colts and the Patriots, New England has steamrolled the Indy defense for 657 rushing yards, and a gaudy 5.1-yards-per-carry average. • Over those past three Colts-Pats game, the Indianapolis defense has allowed 43.3 points per game. • The three starting defensive linemen in the AFC title game, when the Patriots rushed for 177 yards against the Colts, were Cory Redding, Josh Chapman and Arthur Jones. None will be in uniform Sunday night when the Patriots visit central Indiana. The new starters: veteran left end Kendall Langford, rookie nosetackle David Parry and rookie right end Henry Anderson. The Colts’ coach, Chuck Pagano, came from the Ravens with a strong defensive pedigree. Those Patriots rushing numbers—despite whatever logical reasons the pro-Pagano and anti-GM Ryan Grigson forces can conjure up—have to make Pagano want to vomit. They are disgraceful. Parse the blame wherever you wish, but leading up to the game of the week Sunday night in the Deflategate Revenge Bowl, the spotlight should not be on Andrew Luck. It should not be on Tom Brady. It should not be on the gauge measuring the air pressure in the footballs. It should be on the Langford/Parry/Anderson trio. And, if there’s another spotlight, put it on the shifty and quick little back the Patriots have made a vital part of their attack: street free agent Dion Lewis. Jackson’s right: The Patriots will face a tougher, younger, better run defense Sunday night, the kind of front that gives the struggling Colts’ offense hope it can play in the game in the 20s against the high-powered Patriots. Indy surrendered 4.5 yards per rush in 2013 and 4.3 yards in 2014. This year: 3.8. Respectable. 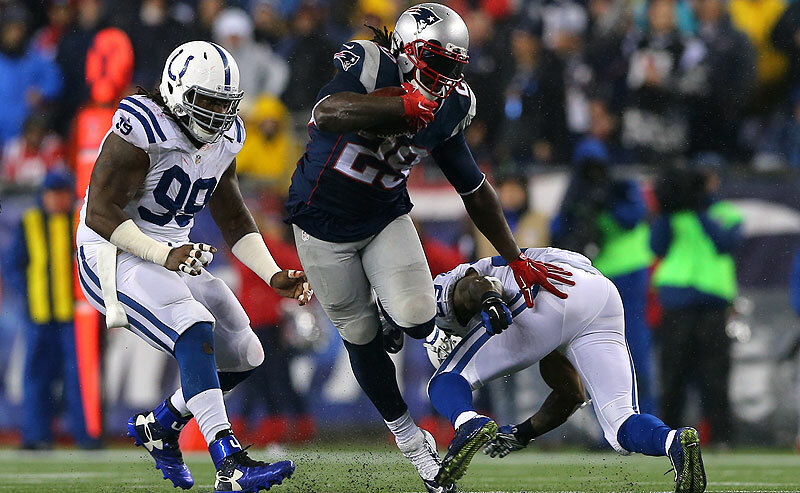 Blount ran for 148 yards against Indy in the AFC title game. Indy’s run defense has been one of the better turnaround stories in this young NFL season. Young is an operative word, too, because the keys to a Colts D that now ranks 12th in yards per rush attempt (improved from 24th a year ago) has been a pair of rookies: third-round end Anderson and fifth-round nosetackle Parry, both from Stanford. The two have been extremely difficult for run-blockers to move. They’ve allowed the Colts to stick with the two-gap 3-4 scheme that Pagano prefers and that the rest of the front seven personnel has been constructed around. There’s reason to believe both rookies will keep ascending as this season progresses. Anderson has good initial get-off—evidenced by the fact that he gets reps as a three-technique on Indy’s four-man nickel D-line. Parry, a stocky 6-1 (likely shorter), plays with natural leverage and has shown an understanding of the nosetackle position’s critical nuances. With a defensive line that can consistently clog the trenches, lighter, finesse-oriented inside linebackers D’Qwell Jackson, Jerrell Freeman and ex-Raider Sio Moore can be kept clean to run and chase. The importance of this game, obviously, goes beyond the fact that the Colts need to play well against a quality foe, which they haven’t done once in five games this year. But it’s Grigson, the Indy GM, who warned the league that there might be some funny business with the footballs used by the Patriots in the AFC title game last January. And it’s the Colts who took the ball that Jackson intercepted and handed it to league officials as evidence that the Patriots doctored the footballs before the game. So for those who wonder if the Patriots—quiet as church mice about anything other than the game, the game, the game this week—will be motivated to stick it to the Colts this weekend, wonder no more. The Patriots will try to score 70. But I question if they’ll be able to embarrass the Colts the way they did last winter. Not that the Indy offense is reliable; New England’s relentless pass rush should give Andrew Luck (or Matt Hasselbeck, if Luck’s shoulder isn’t healthy enough to go) a four-quarter headache. The Patriots are on pace for 64 sacks, which would be a Belichick-era high. And with the news that sturdy New England left tackle Nate Solder is gone for the year with a torn biceps, it’ll be interesting to see if the Colts can take advantage of stout but not particularly quick left tackle sub Marcus Cannon. I asked Jackson how the rookies seemed in practice this week—whether they were at all overwhelmed by the magnitude of the game. Presumably, they’ll have heard about it by 8:30 Sunday night. It’s been in all the papers. 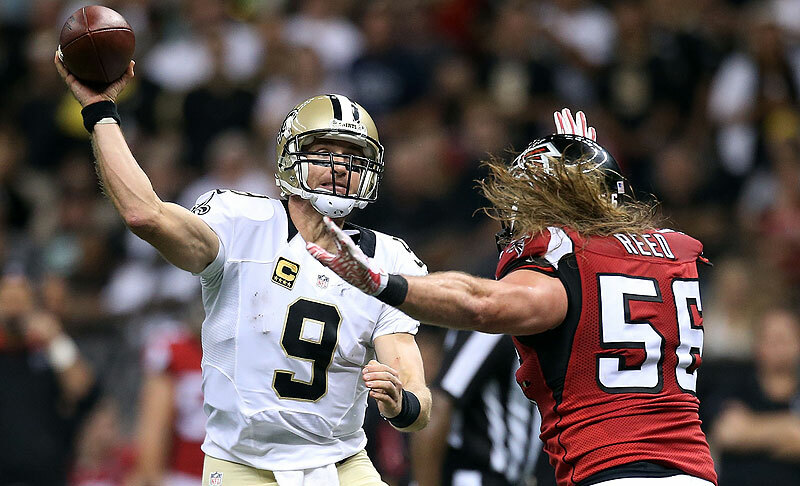 Drew Brees and the Saints handed the Falcons their first loss of the season. New Orleans 31, Atlanta 21. This shouldn't have been a stunner. The only surprise was Atlanta’s carelessness, which included three first-half fumbles. You're not beating Holy Cross with three lost fumbles in the first half. Not with Drew Brees completing 30 of 39 passes for 312 yards with a touchdown and no interceptions. Charcandrick West, running back, Kansas City. Bad news: if you’ve waited this long to pick up the man with the greatest NFL first name since Barkevious, chances are you’re four days too late. When Jamaal Charles was lost for the year with a torn ACL, West suddenly became the most-picked-up player in fantasy leagues across the country; Chiefs coach Andy Reid is likely to use a heavy dose of West starting this weekend against Minnesota. West is an interesting prospect, because the Chiefs consider him a more versatile back than incumbent Knile Davis. The undrafted college free agent from Abilene Christian learned the ropes last year after being a practice-squadder for the first 10 weeks of the season. San Diego at Green Bay. The Chargers’ history with the Pack? Not good. In the past 30 years Green Bay is 6-0 versus San Diego, by margins of 7, 32, 28, 10, 7 and 17. The only San Diego win over Green Bay in the 45 seasons since the AFL and NFL merged came in 1984, when Dan Fouts threw for 376 yards at Lambeau Field, and Kellen Winslow had the most productive day of his Hall of Fame career. He caught 15 passes for 157 yards on a cloudy October day in Green Bay. —Cleveland quarterback Josh McCown, after winning AFC Offensive Player of the Week, on what this week against Denver might hold for him. 1. A pretty strange Super Bowl rematch. Ravens at Niners. Just 32 months ago they were the best the NFL had to offer. Today they’re both 1-4 and in last place in their divisions. The Har-Bowl seems a lot longer than 32 months ago. 2. Kam vs. Cam. Seattle strong safety Kam Chancellor is coming off a poor game, the loss to Cincinnati, while Carolina quarterback Cam Newton is coming off a bye. Chancellor passed off Cincinnati tight end Tyler Eifert into a deep zone twice on Sunday in Cincinnati, and both times Andy Dalton hit Eifert for touchdowns. This game will be another test for Chancellor because Newton’s favorite target is tight end Greg Olsen. Suddenly, with the Seahawks 2-3 and Arizona having a chance to take a three-game lead in the division this weekend, this game is significantly more important for Seattle than for Carolina. 3. Luke Kuechly returns after a month off. The 2013 defensive player of the year has missed all but the first half of the first game this year with a concussion. The fact that it took so long for Kuechly to pass the concussion protocol tells me this had to have been a serious issue. Kuechly’s status bears watching particularly in what will certainly be a very physical game in Seattle. It could be even more physical than recent Seahawks games with the return of Marshawn Lynch from a strained hamstring. Move over, Thomas Rawls. The breakout Seahawks running back will get some carries Sunday, but unless Lynch reinjures himself he should get the majority of the touches in what will be a slobberknocker of a game. 4. Another famous inside linebacker under the microscope. San Francisco inside linebacker NaVorro Bowman has been mostly an every-down player since returning from a serious knee injury that caused him to miss all of 2014. He played 75 of 79 snaps against the Giants last Sunday, including the decisive play of the game: the touchdown pass from Eli Manning to Larry Donnell, in which Bowman was very narrowly beaten for the winning score. “We are looking at monitoring reps,” coach Jim Tomsula said of Bowman. That is probably smart, particularly on obvious passing downs. But watch that Bowman coverage of Donnell again. It was not bad coverage. Bowman barely missed making the play. 5. Dwight Freeney is back, and I think he is going to be a factor for Arizona. Freeney signed for close to the veteran minimum this week to try to make one more Super Bowl run with the hot Cardinals. Arizona coach Bruce Arians told me Thursday that the Cardinals will have a package of plays for Freeney in the game plan at Pittsburgh—pass-rush snaps obviously, with a maximum of about 20. So we won’t have to wait long to see how much Freeney, 35, has left. He buttresses one of the only weaknesses Arizona has—third-down pass rusher. 6. Arians returns to the scene of his prime. The Arizona coach has said often this week that returning to Pittsburgh is just another game for him, but I don’t buy it. Three years ago, the Steelers chose not to re-sign Arians to run the Pittsburgh offense​ and coach Ben Roethlisberger. Arians, of course went to the Colts as offensive coordinator and later interim coach when Chuck Pagano got sick, and then went to Arizona and has done a terrific job in his two and a half years with the Cardinals. I believe he will always remember getting the gold watch from Pittsburgh, and not in a good way. 7. The underrated game of the weekend. I love Denver at Cleveland. Not just because every weekend is another referendum on Peyton Manning’s arm strength, but because Cleveland is not incompetent. No team has gained more yards in the past two weeks than the Browns, shockingly, and Denver may be without ace pass-rusher DeMarcus Ware, who hurt his back against Oakland last week; Von Miller told Fox Sports that Ware will miss a couple of weeks, but there’s been no word from the team on it. Big blow if so. This game is going to be a lot closer than America thinks. 8. More news on daily fantasy sports. Seems like every day or two there is another bit of evidence that is drawing the government closer to launching a full investigation into the daily fantasy business. Stay tuned. 9. Another test for Andy Dalton. In Buffalo, coach Rex Ryan and defensive coordinator Dennis Thurman usually configure a way to bring pressure that a quarterback hasn’t seen on video that week. So Dalton, I’m sure, is going to be ready for some new blitz package. Nothing has bothered him so far in Cincinnati’s 5-0 start. Winning in Buffalo is always a tough task, but this week the Bengals could get a break if Tyrod Taylor cannot play and EJ Manuel starts at quarterback. As of this morning, Manuel’s start appears likely. 10. Who the Giants line up at wide receiver Monday night in Philadelphia. I laughed when I read these comments from Eagles defensive coordinator Bill Davis this week, about which Giant wideouts he expected to see in the game: “I think they are all going to play, I really do. I don't think it will affect them.” Well, Victor Cruz hasn’t practiced since Aug. 17; he’s not playing. Odell Beckham Jr. is iffy with a hamstring injury. Rueben Randle is iffier than Beckham, also with a hamstring. The three healthiest Giants receivers: Dwayne Harris, Myles White, Geremy Davis. They’re not even household names in East Rutherford or Moonachie.